KJIPUKTUK (Halifax) – On Wednesday evening several MLAs representing all three parties attended a screening of My Week on Welfare at the auditorium of the Nova Scotia Art Gallery in downtown Halifax. My Week on Welfare is a wonderful documentary, produced by Jackie Torrens, that offers glimpses into the lives of income assistance recipients, families and individuals both, trying to make ends meet on a scandalously low food and shelter budget. The screening was organized by BRAG and CASAR members. What follows is what poverty advocate and Nova Scotia Advocate contributor Tim Blades told the MLAs. Good evening everyone. Thank you for joining us tonight for this screening of My Week on Welfare. My name is Tim Blades. I am a 40-year old income assistance recipient, a member of BRAG (The Benefits Reform Action Group) and also a member of CASAR (The Community Agenda for Social Assistance Adequacy and Reform). I am going to speak tonight about the stigma that I and others on Income Assistance face. I am going to provide some commentary on the ongoing Employment Support and Income Assistance (ESIA) program transformation and the consultation that the Department of Community Services (or DCS) has engaged in. I will also illustrate why someone like me, with my knowledge and lived experience, should have been involved in a truly meaningful consultation with those who have the power to change things. The next quote is from Dr. Carolyn Bennett, from the Department of Family and Community Medicine, University of Toronto. She was also Canada’s first Minister of State for Public Health. 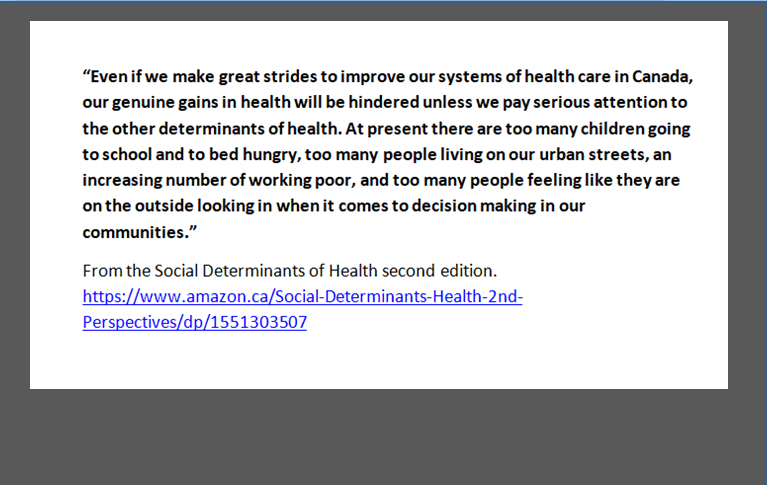 Income is a Social Determinant of Health. If a person cannot afford to eat healthy, or eat at all, their health will suffer, they will become ill, and they will become familiar with the issues involved with our health care system. I say this as someone who has been in diabetic remission for several years. I consider that to be quite an accomplishment, considering my diabetes was at deadly levels when I was diagnosed. I spent my entire hospital stay in a hospital staff break room. I shared that article to my Facebook timeline. The second image, Redd Foxx, was posted by someone as a response to my statement. To be clear, I am grateful for the changes that have been implemented; However, I do stand by my statement. These changes are not enough. Effective Oct 2018, ESIA recipients in Halifax will lose their transportation allowances. This is due to the implementation of new annual bus passes. With criminally low Income Assistance rates, many ESIA recipients use a portion of their transportation expense to buy food. The loss of their transportation expense amounts to a cut in their food budget. The fact that there is a 2 or 5 percent increase coming in the fall of 2019 is of little comfort to people who are starving now. Currently, 50% of Feed Nova Scotia clients are ESIA recipients. The consultation that has taken place is not enough. When groups such as CASAR request to have time with the premier or the Department of Community Services Minister, we are forwarded to the Executive Director of the ESIA program Brandon Grant. Mr. Grant, by his own admission, doesn’t have the power to make changes. We are thankful for his time, but he is not the person we need to meet with. I coupon. I am involved in a few “points” programs, and I often take advantage of rebates. I belong to several local couponing Facebook groups where people share information on deals and coupons. If I become aware of a free sample or a free product coupon, I order it. I love couponing. It makes my life easier because it allows me to save money and help people. If I can get something for free or for a few pennies, I get it. Anything I don’t need, I give away. Sometime I donate things to the food bank, but usually I give stuff to a small group of people. That small group of people that I help is fairly diverse. There are people who are disabled, on welfare, and unable to work. There are people who are on welfare, while also working. And contrary to what images two and three would have you believe, some of the people are working full time and not on welfare. They are, to steal a quote from Mr Foxx, “on their feet”, working full time, and yet they are suffering from the trappings of poverty, such as poor quality housing. The working poor are heavily taxed, and some are single parents who work full time. Not only are they taxed, but they pay for childcare and are charged in other ways. A friend of mine, a friend that I help, makes over $20 an hour and is a single mom, and deals with an ex that often isn’t very helpful. This is someone who has been denied certain forms of help, because on paper, she makes too much. While tonight is about Nova Scotia’s ESIA program, I would be remiss if I didn’t acknowledge the broader scope of poverty. Having a job, even a $20+ an hour job, doesn’t guarantee escaping the trappings of poverty. We must widen our scope when considering poverty; take a hard look at taxation and a person’s circumstances, because having a job doesn’t mean you will leave poverty behind you. 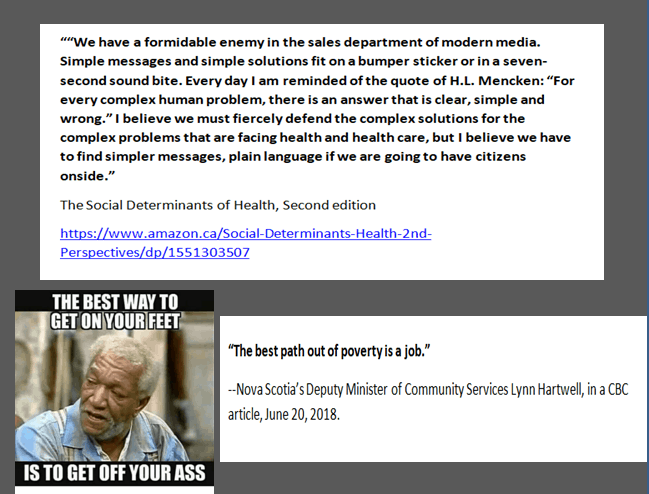 Currently, 17% of Feed Nova Scotia users are the working poor. Those who govern must stop asking those that they govern to trade one form of poverty (welfare) in for another (the working poor). As I’ve mentioned, this friend is a single mom. I was also raised by a single mother. My mother raised me and my brother while on welfare. There were times where we had very little to eat. When I was old enough, I worked for a few hours a week in the school library, and I went to the food bank, but even with that, ends would never meet. Poverty has an effect on a person’s mental health. Life is very stressful when you don’t know how you will eat in a day or two, when you can’t go on the class field trip, or you don’t have a bagged lunch so that you can play basketball at lunch time. That was life. “Why bother living when you can’t even afford to live?” Is an alarming statement. It’s even more alarming when it comes from a loved one who has a history of mental health issues. If you have any knowledge of the ESIA program, you know it is unfortunately common to have paperwork mysteriously vanish at DCS offices. Now put yourself in the shoes of someone suffering from a combination of mental and physical health issues, and you pass in whatever paperwork your caseworker asks for…and it vanishes. And then you lose your special diet or phone expense because someone at DCS says you didn’t get the paperwork done. Then imagine that you have no one to advocate for you. You don’t know what agency can help you, because the illness you have leads you to socially isolate yourself. This happens. As I’ve said, I was a child on the system. Dealing with my home life, which was complicated by poverty, caused me to contemplate suicide as a child. I had ulcers at 8 years old due to stress. I grew up in the 80s and 90s. According to a recent Chronicle Herald article, 806 Nova Scotian children were hospitalized in 2016 due to mental health concerns. As an adult, I still suffer from anxiety and depression. Looking back at my childhood, I know having just enough money to not worry about food, just enough money that getting a dental procedure didn’t mean going without food for a few days, just enough to have adequate clothing, would have made a big difference in my life and would’ve given me a better foundation to start life on. 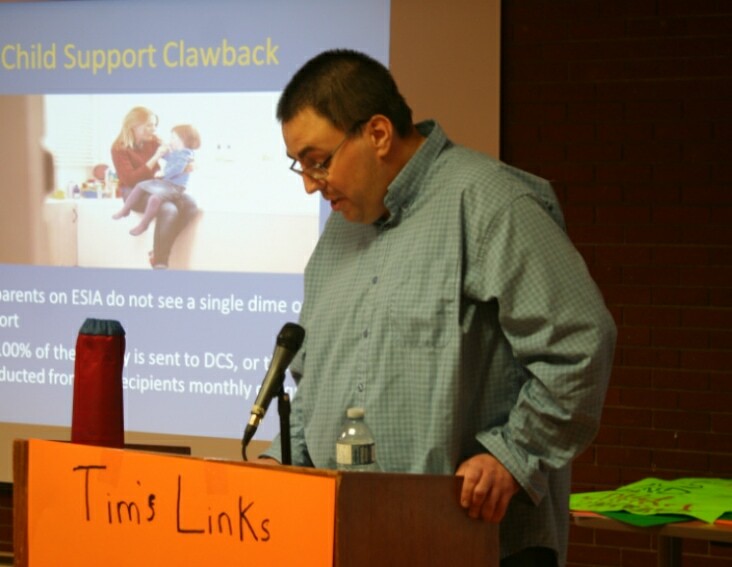 About two years ago, I learned about the 100% child support clawback for ESIA recipients. Until recently, if you are on ESIA and you are supposed to receive child support from your ex, you didn’t get a dime of it. 100% of it went to the Department of Community Services. Like most people, I was outraged to find out about this. I wrote an article for the Nova Scotia Advocate, that also includes excerpts by Jackie Torrens. I am particularly proud of this article, because I feel it helped start a movement. It wasn’t until sometime after my child support article that I realized the child support clawback already existed when I was a child. With everything I went through in my childhood, even if my father were around and wanted to help financially, he couldn’t. It would’ve been all taken away. Having my father in my life would’ve made no difference at all in my battles with poverty. This revelation was reflected during a speech I gave on Oct 4th 2017, during a My Week on Welfare screening. After that, some fellow activists joined with me, including the Dartmouth North MLA. We went door to door with a petition, and heard other people’s stories about the clawback and ESIA in general. When the premier became aware of the clawback, he called the practice “unfair”. The child support clawback was ended in Aug 2018. I’ve learned recently that Nova Scotia Housing, a division of the Department of Community Services, counts child support as income when calculating tenants rent. Thanks again for coming out tonight. This is our sixth screening of My Week on Welfare in 15 months. We have one five days from now for the Canadian Mental Health Association that is just for their members. We also have another on Oct 30th 6:30 pm at the Sackville Public Library. That one is open to the public. These nights came about because I had an idea and two other colleagues had an idea, and we put those three ideas together, and these My Week on Welfare screenings are what we came up with. At these events, members of the audience speak up and share their stories, they ask questions, and in some cases are able to get help with a struggle they are having with the Department of Community Services. “Even if we make great strides to improve our systems of health care in Canada, our genuine gains in health will be hindered unless we pay serious attention to the other determinants of health. At present there are too many children going to school and to bed hungry, too many people living in our urban streets, an increasing number of working poor, and too many people feeling like they are on the outside looking in when it comes to decision making in our communities.” This quote is from Roy Romanow, former Premier of Saskatchewan. I am not rare. Like many others, I find myself in a combination of circumstances. I am a caregiver. I live with mental illness. I also have a rarely diagnosed genetic condition, coupled with rare symptoms, called Alpha 1 Antitrypsin Deficiency. I was diagnosed with Alpha 1 10 years ago, and I have been sick with it for at least 15 years, in addition to tackling diabetes and dealing with non-epileptic events. Like many others, my knowledge of poverty is a combination of lived experience, observing and listening to others, and research. Like many others, I know what some of the problems are, and I want to be part of a solution. Those who are on Income Assistance, as well as their advocates, want to have meaningful consultation in regards to the ESIA transformation. According to the Canadian Centre for Policy Alternative, between the legal system, the health care system, and lost productivity, poverty costs us 2.4 billion dollars annually. I will end my speech with a question that is clear and simple: DCS, why aren’t you having meaningful consultation with us? The Sackville Public Library screening has been rescheduled and will now occur on Nov 22nd, 6:30 pm.